The sub title of this blog is "for those who love small streams, wild trout and life....in their simplest form"... I hope you'll agree. Thanksgiving we had the family gather for dinner. Lots to talk about, lots to eat and some football. While in the midst of these happenings our grand-daughter Morgan asked if the fly tying desk was operational to which I replied yes. She then proceeded to leave for a while, saying I'm going to tie a fly. Some time passed and she said '"what do you think".....showing us the fly she tied. It's a streamer that looks pretty simple, but. The wing is constructed using what's called a "complex wing" it uses multiple feathers layered in a fashion to create a beautiful pattern. I will fish this streamer as an attractor and believe it will take a few. What should it be named? When I was growing up every Sunday after church the family would meet at moms house for coffee. Along with coffee there would always be various fresh rolls hot from the local bakeries. My favorite was the "horn", this odd shaped poppy seed covered horn was spread with butter and devoured with coffee. It has been a long time since those days. Last year I found a local bakery that continues to bake the "horn" as I remember. Light, delicate, lots of poppy seeds....simple elegance. This was a day for exploring. A day where the sun was bright and the air crisp. Included in the mix was a strong gusty wind that did it's best to scrape the forest floor of it's fallen leaves and deposit them in the stream. Not a problem for it's all part of the small stream experience. This area was new to me and I had an idea that there were brook trout present. As I walked along quietly my that idea was proven to be correct. Brookies would dart upstream and seem to disappear among the banks and drowned leaves that covered the stream bottom. My plan was to spook the fish "which I do very well" wait for a little time and then present the fly as close to the bank as possible. Using this method I was able to coax a few brookies to take. It's so nice when a "plan" comes together. Some remnants of what used to be, perhaps a century ago. In this little pool were three beautiful white finned brookies. They were holding in a staggered pattern through out, one at the head, one in the middle and one at the tail-out. I got into position upstream and let the fly drift, I figured one of the fish would take. As the fly drifted to almost the first trouts nose a sudden sprint form the last fish was observed and that brookie took it. Unbelievable beauty....they are feeding heavily now in preparation for winter. The "stream in the valley". Some weeks back while fishing I noticed this lovely fir tree. While taking a photo of it i thought this little tree would look good decorated. Being there are only wild creatures about I said the decorations must be edible. Well yesterday morning while the turkey was roasting Jeanette and I began stringing garlands of natural popcorn, cranberries, walnuts, and suet balls to decorate the little tree. We also had a few pumpkins that we were going to bust up and an apple or 2 or 5. This morning in the gray-drizzle Jeanette and I along with our grand-daughter Morgan walked along a path to where the tree was. When we arrived at the chosen tree Morgan and Jeanette strung the garlands and suet balls. The pumpkins were then smashed and placed along the bottom of the tree. It's a little treat for our wild friends. I want to wish everyone a "Happy Thanksgiving"
Saturday morning I had the pleasure of fishing with Mark. It had been about six months ago we last ventured on a small stream together. We met around 10 and Mark so graciously provided coffee and muffins, corn muffins that is, such a treat. While enjoying that snack we discussed the brutal summer and hoped that the recovery would continue. A few other issues were put on the table and we resolved everything to a wonderful conclusion. We then rigged up and headed for the stream. I had a dry fly on, a "Cinberg", which is a soft-hackle dry fly, Mark had on a dry also a Adam's Parachute. During the entire outing I believe we only used two flies. Mark stalking brookies. Low profile, some camo, and the rest earth tones. My first brook trout of the day. There was no resisting the Cinberg. That fly continued to produce, but I knew the fish were there just in a different portion of the stream like the bottom. Tough fishing, but the rewards are enormous. In that pool a rising brook trout was observed...eventually Mark hooked him on a Elk Hair Caddis but the fish slipped the hook. Beauty along the stream. Mark and I agreed that to fully convey the experience of a small stream is hard. We try to convey that experience in photos as best we can. The fish were holding in tight places, but I managed to coax a few to the fly. 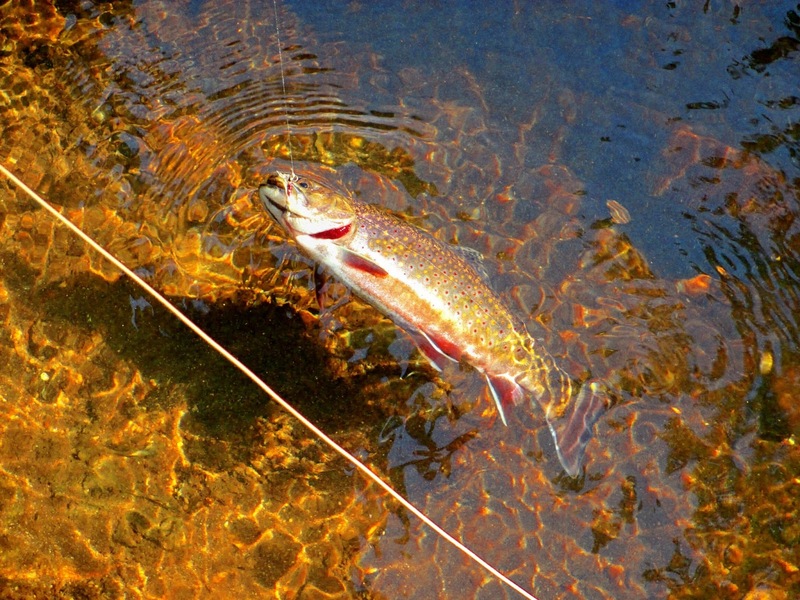 Wild brook trout....New England small stream fishing at its best. This was the last place I would fish on the way up. The little foot bridge provided shade, and the sun was low enough that the undercut bank was in shade. I made my cast upstream of the bridge but was unable to get the fly near the undercut. I moved to the other side of the bridge while hoping I did not scare any fish. I cast the fly to the bank and suddenly a fish darted out and took the fly. Moments later I slid my hand under this marvelous fellow. I could not believe how dark he was, almost black. His orange flanks seemed more pronounced in comparison to his very dark body. Another feature of this male was his black mouth. It was a great day...we enjoyed each others company, we were rewarded with some fine angling, and found a good deal of hope for this stream and it's residents. Over the years streams experience changes. Some of the changes are swift such as a hurricane, or ice storm, and some are subtle like a fallen tree changing the size of a pool. When I fished this stream mid week I noticed a particular run I was very familiar with. It was where I first took my grandchildren to fly fish for brook trout. While they were more interested in most everything else about the stream they did manage to toss a fly for a spell. It was August of 2011 that they were introduced to Papa's little stream. The little stream in August 2011. This is a favorite place of mine. Sorry for the poor photo. This is that same run, November 16 2016. 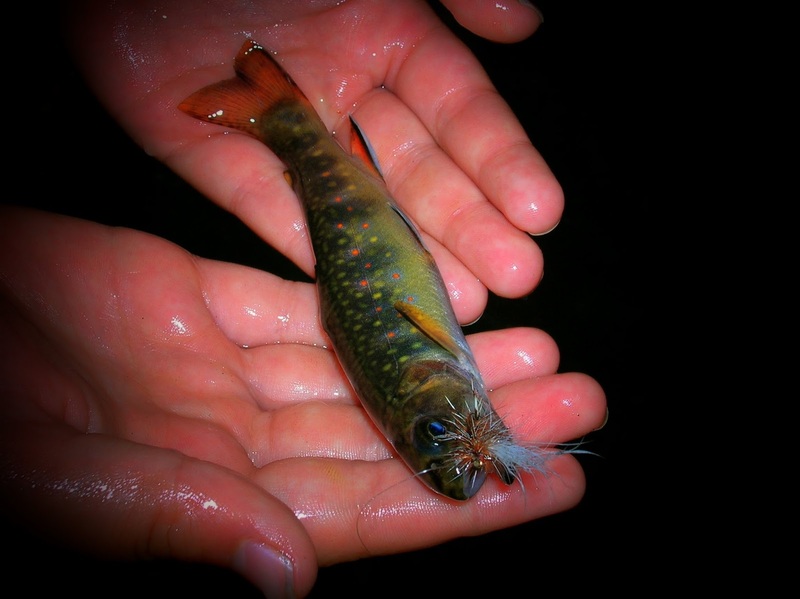 On that day in August of 2011 Ethan caught this wild brook trout. His first on a fly. It was taken from that run in the second photo. This pretty lady was taken from that same run, in November 2016. So in five years there really has not been much change. The stream and the brook trout are doing fine. Papa and Ethan are also doing fine....may it continue. On November 17, 1969 Jeanette and I were married. This our anniversary we went out early and took our 3 mile walk. Arriving at home breakfast was made and we enjoyed scrambled eggs, sausage, and fried potatoes. We then got together several bags of assorted can goods and other non-perishable food items along with a frozen turkey and donated them to the Newington Food Bank. We then went to Mohegan Sun for a beautiful meal. Through out to day we looked back on all those years. It was beautiful. The photo of Jeanette and I was taken on the foot bridge that spans Red Brook, a place we both love. I read a post last week by Mark over at "Fishing Small Streams" about an outing he recently had on a stream that we both love. After reading it I decided to check out the stream and found some surprises. The water flow was good and there were many deep pools. Looking into the water I saw brookies, some darted away swiftly and others just sat on the bottom doing what brookies do. The air temp the day I fished was warm probably near 60 degrees, the winds were not a problem. A few runs had leaf dams, and usually near these was a feeding brook trout. As I walked along it seemed to me that the trout in this had completed their spawn for they were feeding with a mission. Not only were the brookies on a mission so were the snakes. I saw a few little guys here and there. If you look closely you'll see one here. This is a lovely little run, a favorite of mine. I stood upstream and watched several trout feeding on the surface. Bright sun, and clear water was not an issue...they rose freely. Several brookies like this fellow came to hand from one run. As I approached this pool I scattered several trout. These fish seemed to be a bit larger. I circled above trying to not spook them again. Upstream I observed them slowly returning to their former positions. I cast the fly and watched it drift. I saw a trout move to it and as it rose I pulled to quickly, but he followed it and finally took it. In a few moments a beautiful wild jewel was at hand. He was a true giant for this stream and a blessing. As I released him back into the cold water I could not help to think how the will and the fortitude this brook tout had to make it through this past summer. They are a special breed. As I looked at this photo at home a few features stood out. I saw a hump forming on his back, his teeth were protruding almost like a salmon, and he was in perfect condition......carry on my friend. A few years back a group of streamer tyers got together for a challenge. As you know or probably not know Carrie Stevens tyed her streamers without a vise, a feat that most tyers, let alone commercial tyers would not even think of. The streamer selected was "Carrie's Favorite"...we all tied our versions of the streamer with out a vise. It was fun, but something I'd probably never do again. During the process my wife told me I had invented 10 new swear words. The experience gave me so much more respect and admiration for what this lady had accomplished. This is a streamer I tied to commemorate the birth of my grand-daughter. The streamer is named "Morgan's Fancy"
A streamer I tied to commemorate the birth of my grand-son. The streamers named "Ethan's Dragon"
This streamer was a request from an old blogger by the name of "Midgeman" he wrote a fine blog that was devoted to the midge, there were hundreds of patterns. 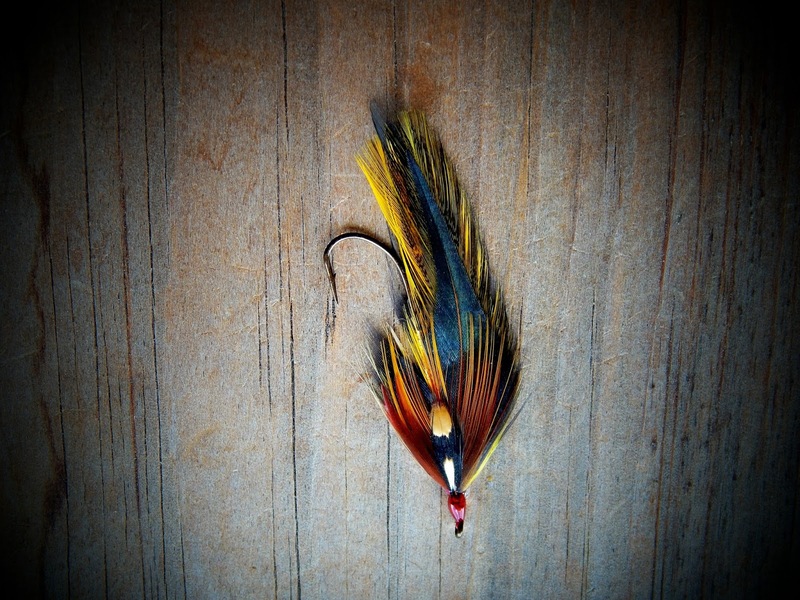 One day he told me of a hairwing streamer that he favored and asked if I could tie it in the "Rangeley" style. The fly is called the "Platte River Special"
Cabin Creek, this lovely little stream that flows through some very pretty scenery. The mix of hardwood and fir is so pleasing to the eye. I have not been fishing here in some time so I was anxious to see how it fared over the summer and early fall. The waters were flowing and although a good rainfall would help it seemed to be just fine. It did not take long for the first fish to pick me out and he was soon gone. I did not know if it was a brown or a brook trout for this stream has both. With low water as this it's better to fish a dry fly, at least that's what I think. I chose a few that have always produced for me. Moving upstream I had some response to the fly with several rises and even a hookup but nothing to hand. I consider such a day as productive for there is so much more to this than catching a fish. I came upon a stand of these little fir trees. They stood straight and strong. Their branches seemed almost perfect. Later this month Jeanette and I will come back to decorate this little tree. The ornaments will be pop corn, suet in various colors, and an assortment of nuts. I know I said that fishing is not catching but a tug on the line would help. Coming upon a place like this told me there is a trout in here. The fly entered the water and the fish grabbed it. I was fortunate to bring him to hand. A handsome wild brown...the only fish that came to hand, but what a treasure. This small run produced two hook-ups but both were lost. A wonderful day on Cabin Creek. Nearly 100 years have passed since Private First Class Peter V. Farley was killed on a battlefield in France during World War I. Many things have changed since then, but the South Branch of the Raritan River still flows less than half a mile from his burial place in Califon, New Jersey. 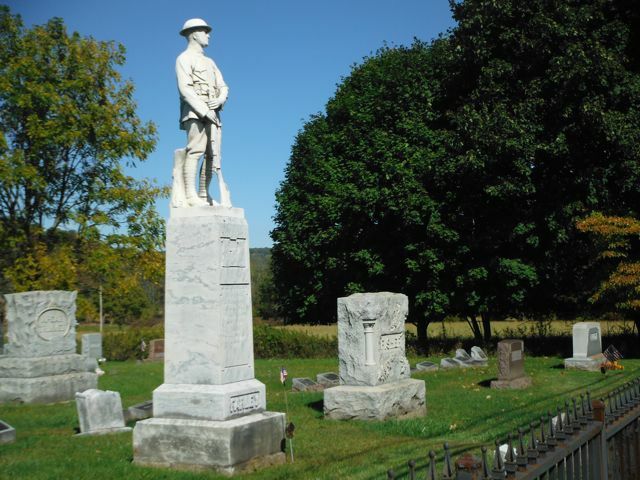 Almost every fly fisher in the state will at some time come to this area to enjoy the river’s excellent trout fishing, and in that journey, drive past Lower Valley Cemetery and the large monument of a soldier that marks Private Farley’s grave. For a long time, I didn’t give the monument any special thought. I was either in a joyful mood on my way to fishing, or too relaxed on the way home after a morning spent on a beautiful stream to give much attention to a cemetery on Rt. 513 that looks pretty much like every other cemetery. It wasn’t until my friend, who is known as “the Streamer King”, and has a penchant for history, directed my attention to the image of the soldier that I started to pause and think on every trip to the river about the man who is buried there. That day, the Streamer King started a tradition that we always follow whenever we drive past. An eventual stop at the gravesite to read the inscription informed me of the soldier’s rank, full name, and military unit served. His date of birth is inscribed simply as 1887 without a specific day, but it is significantly noted that he was killed in battle on September 26, 1918, just weeks before the armistice that ended the war. Standing on the grass near the grave, without the physical distance of the road and without my car to provide a layer of emotional insulation, I imagined the hardship and tragedy endured by this lone soldier and his family, and thought of the sacrifices that many have made so I could have the freedom to do the things that I cherish. I wanted to know more about Peter V. Farley and to gain a deeper appreciation for all of our veterans. An Internet search provided census information, and the 1910 census shows that Peter V. Farley resided on Philhower Road in the township of West Tewksbury, a rural community of farms and homesteads at that time. His father’s occupation is listed as “Carpenter” on the official document, but no occupation is given for the then 23-year-old future soldier, and I’ve been disappointed to not find information about Peter Farley’s pre-military life. A visit to the Califon Historical Society, and conversations with the society’s friendly volunteers, turned up a rumor that Peter Farley is not actually buried in the location of his monument, but may actually be buried in France. This was a surprise to me, and started a new avenue of investigation that at least provided some likely explanations surrounding the events of Private Farley’s death. A search of World War I battles shows that the date Private Farley was killed in action matches the start of the Battle of Argonne Forrest. American Expeditionary Forces played a key role in this pivotal battle, which continued until the armistice, and forced the German army from previously held critical territory. The AEF suffered enormous casualty numbers, with more than 26,000 soldiers killed, mostly in the early days of the battle, making this one of the bloodiest battles in U.S. military history. More than 14,000 American soldiers are still buried at the Meuse-Argonne Cemetery in France. These statistics seemed to at least give plausibility to the rumor that Private Farley was not buried in Califon. I contacted the Meuse-Argonne Cemetery with the full name, rank, and date of death for Peter V. Farley. A prompt response indicated that he is not buried there, or in any of the overseas locations administered by the American Battle Monuments Commission. 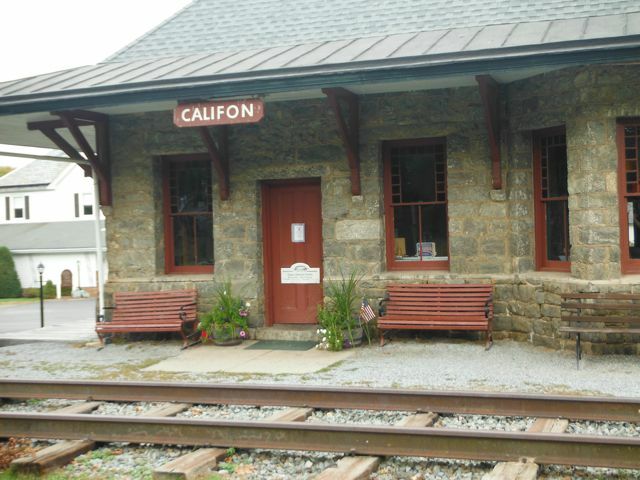 Local Califon historian Don Freibergs, current owner of Rambo’s Country Store, which has been in the center of town since one year after Peter Farley’s birth, was very helpful in providing me with a local newspaper article from the 1920’s supporting that Private Peter V. Farley is indeed buried where you see his monument in Califon. A call to the Lower Valley Cemetery revealed that although he was killed in the fall of 1918, Peter Farley wasn’t laid to rest in Califon until the summer of 1921. In keeping with a common practice in WWI, he remained in France for nearly three years until our military could undertake the large task of returning loved ones to families that requested a burial in the United States. Repatriating these soldiers was a logistical nightmare, and our military performed admirably and honorably, operating in areas ravaged by war, and in a world that was just beginning to recover from the historically deadly flu pandemic of 1918-1920. Information from the National Archives spelled out more details. Private Farley’s body returned from Europe on the steamship “Wheaton”, which made many cross-Atlantic voyages to return several thousand fallen servicemen. The Wheaton docked in Hoboken, NJ, and Private Farley’s body, escorted by Private Lewis Cooper of the 18th Infantry, was transported by rail to the train station that is now used by the Califon Historical Society. Peter V. Farley was brought back to the house where he was born, until his burial beneath the monument in Lower Valley Cemetery. and God bless the dear boys that are left over on the other side. May their names ever remain in the hearts of the people that are left. They have lost their lives for the world. There are so many unanswered questions that will probably remain unanswered. After reading the parent’s poignant letters, I wish that I could somehow correspond in return, and say to them, “tell us all about your son”. We would have what must surely be the lost stories of a vibrant young life, instead of just the forever still monument. In a way, the unanswered questions and dead ends surrounding the details of Peter V. Farley’s life and death hint of a larger truth. If we don’t value the stories of our veterans and make concerted efforts to know them, then it doesn’t take much for the knowledge of their deeds to fade with the passage of time. Looking through the census of 1920 is also a stark reminder of truth and the passage of time, because it doesn’t include Peter V. Farley. No one ever knew a middle-aged Peter Farley. He, like so many before and after, is left through the tragedy of war, young for eternity. It’s a cost that seems too great to bear, and needs to be recognized. Regardless of political persuasion or personal views concerning the wisdom or lack thereof of a particular military action, the men and women who serve our country are extraordinary people, and we have the human obligation to understand their experiences. The life and death of Private Peter V. Farley reminds us that the time to listen to their stories grows shorter and more precious. We have parades and ceremonies, but on a deeper level, there are the small things that are more meaningful than all of the parades, ceremonies, medals, and monuments. There are the personal items left at graves across the country, at The Wall in Washington, and the silent prayers said by people who miss loved ones everyday. And for this soldier, buried in Califon for almost 100 years, who gave his life in the war that established the date for Veteran’s Day, the Streamer King and I roll down the car windows every time we pass by, and with deep appreciation call out what is meant for all of our veterans. 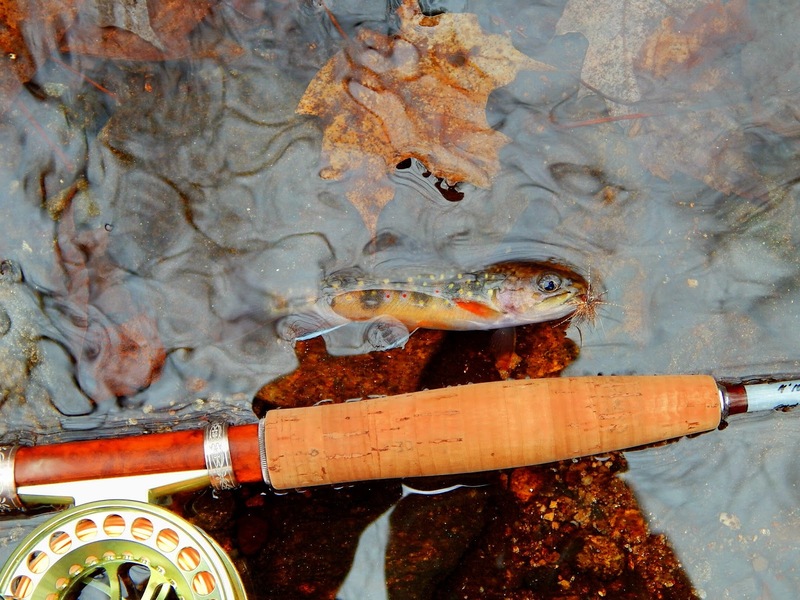 Red Brook is more than a stream to fish, it's a special unique waterway that holds one of New England's most beautiful native brook trout. I have been coming here for a lot of years. My wife and I find this place refreshing in both mind and soul. The 3-4 times a year we visit are truly highlights of our year...many times we've said you don't have to catch a fish here and you'll still be fulfilled. This year we were given the pleasure to meet a few young men there. Geoff Klane and Justin Fleming. 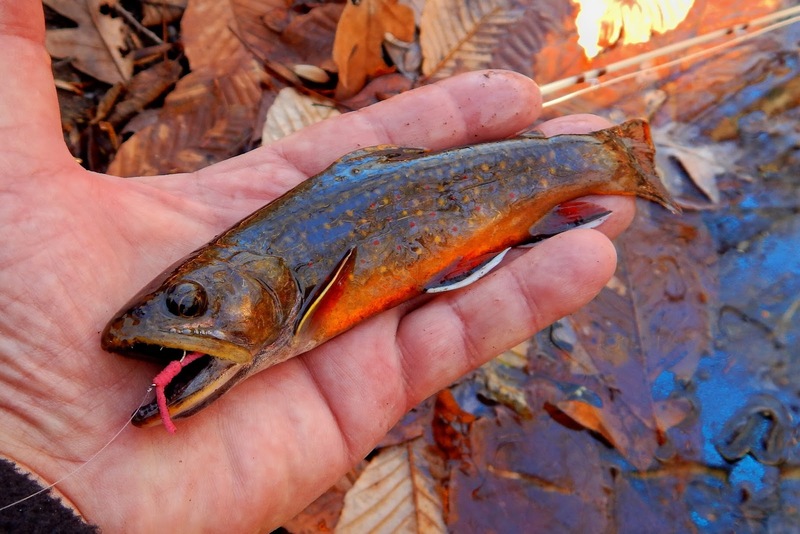 They hold the same feelings for these "salter" brook trout, and it shows. I have been fishing for trout, brook trout when I can. I have fished from Maine to Virginia and in all seasons of the year. I have been as ethical as anybody when it comes to angling. But I must say that this time I seemed to have done something not so good, at least by some people's standards. The impression I got was that I did not belong on the stream. I take this very deeply. So with that said, this will perhaps be the last time I visit this beautiful area.